The Lakeside Collection catalog is a home decor catalog / furniture catalog from The Lakeside Collection based out of Northbrook, Ill. The free catalog details items for your home, family, and hobbies. The Lakeside Collection catalog is also a gift catalog where you'll find collectibles, DVDs, books, electronics, and more. They also provide perfect gifts for family and friends for the holiday seasons. The Lakeside Collection catalog boasts quality products for low prices, helping you make your house look great while saving money. Click the Catalog Request page on The Lakeside Collection's website and fill out the form to start receiving your free catalogs in the mail. The catalog request form requires your first and last name, mailing address, and email address. While you must fill out all of those fields in order to receive the free The Lakeside Collection catalog, you don't have to create a user account or pay for shipping. Note: By default, before you request the free catalog from The Lakeside Collection, you're automatically enrolled in an email service to receive The Lakeside Collection promotional emails. You can uncheck the box next to that option before you sign up for the free catalog if you don't wish to get those types of emails. Unchecking that box won't affect whether or not you can get the catalog for free. Choose the Sign Up button after finishing the form to submit your request to The Lakeside Collection for your free catalog. Expect the catalog within the next three weeks, although it may arrive sooner. Once submitted, you will get an email that confirms your free catalog request from The Lakeside Collection. This email is purely informative, so you don't have to verify your address, confirm the email, or do anything else at this point except wait for the catalog to reach your door. 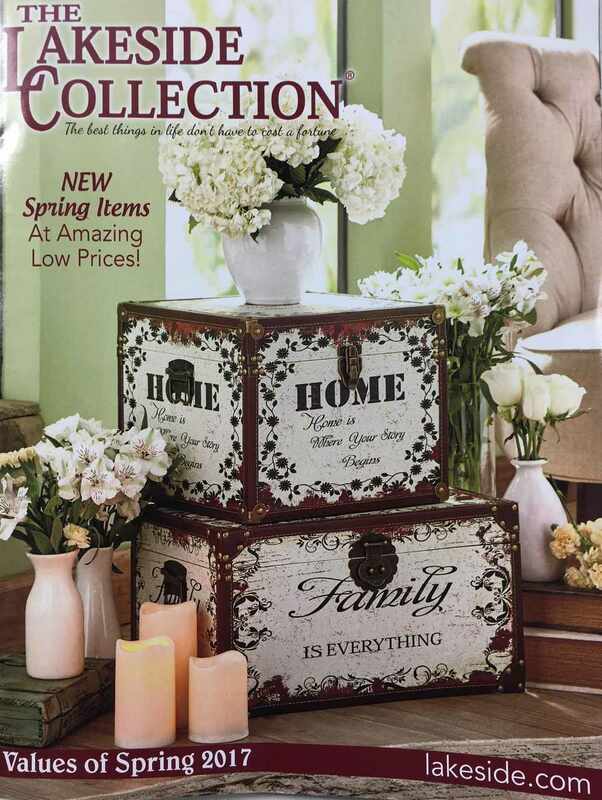 Tip: If you just can't wait the three weeks to get your The Lakeside Collection catalog in the mail, you can browse many of their current and upcoming catalogs online on The Lakeside Collection's website. Viewing the catalogs this way is handy not only because you can do so instantly from any computer that has access to the internet, but also because you can sort all the products by price, some of which aren't even included in the paper catalogs. Some home decor, gift, and furniture catalogs from other companies can be mailed to non-U.S. addresses, but if you want to receive a free The Lakeside Collection catalog, you'll, unfortunately, need to be living in the United States. However, if your address is outside the U.S., use the link above to see The Lakeside Collection catalog online. Since it's accessible online, it doesn't matter where you live as long as you have an internet connection. If you like The Lakeside Collection catalog, you may also like the home decor and furniture catalogs from Blair, Brylane Home, Collections Etc., Miles Kimball, and Frontgate. Some free gift catalogs you should check out too are available through ABC Distributing, Current, and What on Earth.